Peel onions and cut them into thin slices; you should have about 6 cups (exact amount is not crucial, though). Mist the inside of the ceramic insert for the slow cooker, place onions in cooker and drizzle the oil over the slices. Cover and cook on high 10-12 hours, until the onions caramelize. They will have a deep brown color. Leftover caramelized onions may be refrigerated, covered, up to a week or two. They may be frozen up to 6 months. 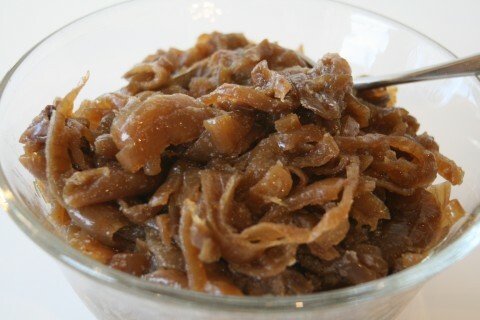 Portion out the caramelized onions into little freezable containers, label them and freeze for future use. I usually have 1 opened container in the refrigerator, and the onions find their way into many things as I’m cooking during the week. When I use those up, I can just reach for another small container from the freezer and I’m ready to go again. You may use butter instead of olive oil. I skew to olive oil for health reasons, but butter is what you would use if you were doing them in a skillet. You will get best results in this recipe by using regular onions, according to Kim Reddin, director of Public and Industry Relations for the National Onion Association . Because storage onions have a higher percentage of solids and less water (in comparison to sweet/mild onions), they are ideal for long cooking. Storage onions (available September-April) hold up better under long periods of heat and will produce a higher yield. When you eat raw storage onions, you will taste the sulfur compounds that give them that strong onion flavor; however, when you apply heat to them, the sulfur compounds dissipate, allowing the sugars to become caramelized. Our palate doesn’t perceive the high sugar content until heat is applied. When heat is applied to sweet/mild onions, often the sugars evaporate in the water shed during the heat process, leaving a “weak” onion flavor.